The 5/6 League will not have player evaluations. There will be a new structure in the 5/6 League at East for 2019. 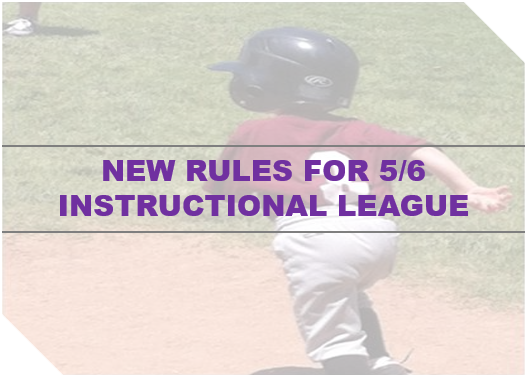 The 5/6 Instructional League is designed to introduce baseball concepts and skills to those players new to the game of baseball in a fun and relaxing environment for players and parents alike. Each game will now include 20 minutes of formal structured practice prior to two full innings of play. The practice session will include multiple rotating stations where players will focus on batting off a tee, soft toss, fielding, and base running. Following practice, teams will play full two innings, where each player will be guaranteed to hit twice. In addition, players will not only learn the value of hitting, but will learn the value of playing good defense, as successful defensive plays will be recognized as an out as well. Outs and runs will not be kept, as this is purely an instructional league. All returning players who were part of the 5/6 year old league last year will be placed back on the team they played for in 2018, unless the league is directed otherwise by the parents or guardians for that child to be placed back in the pool of open players to be placed on a team for 2019. Our goal is to have teams placed by March 15th. Click here to go to the 7/8 Structured Coach Pitch League Assessments page.